Apple released the latest versions of Final Cut Pro X (10.4), Compressor (4.4) and Motion (5.4) this morning. I’ve had the opportunity to work with a pre-release version of these applications for a bit. Here are my reactions. UPDATE: I’ve gotten a lot of questions about FCP X and High Sierra. FCP X 10.4 requires Sierra (10.12.4 or later). 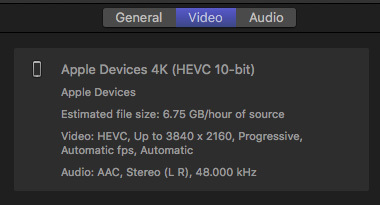 The only feature that requires High Sierra is HEVC encoding and playback. VR does not require High Sierra. Libraries now support both SDR and Wide Gamut HDR color processing. This means we can set individual libraries to either Rec. 2020 PQ or Rec. 2020 HLG color space. Which allows us to edit, color grade and output a wide variety of HDR media. HDR requires shooting at least 10-bit camera native media. The actual HDR look is created during color grading. Editing HDR material is the same as editing HD. UPDATE: Apple has published an 18-page white paper: Working with Wide Color Gamut and High Dynamic Range in Final Cut Pro X. It is worth reading – here’s the link. Video scopes now display SDR or HDR values, depending upon the library and project settings, as well as the media you are editing. And, thinking of color grading – WOO-HOO!! – color correction is now built into the Inspector – using the new Color Inspector. This allows us to use the traditional, and much maligned, Color Board – or – Color Wheels – or – Color Curves – or – Hue/Saturation curves. And, we can set a preference for our default color choice. Not being a colorist, this was my first exposure to Hue/Saturation curves – what they do is amazing. 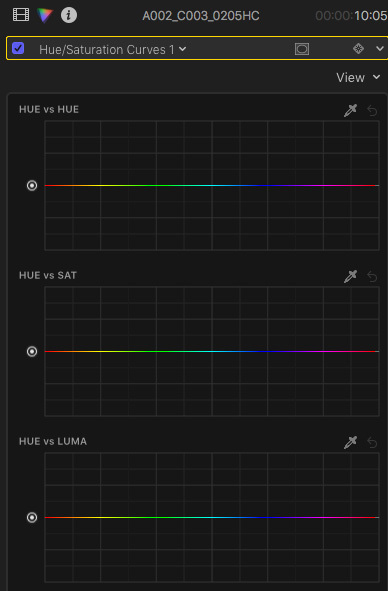 Select a hue, then replace it with a different hue. The more I played with this, the more I started giggling. This takes the capability of the original color mask and blows it out of the water. 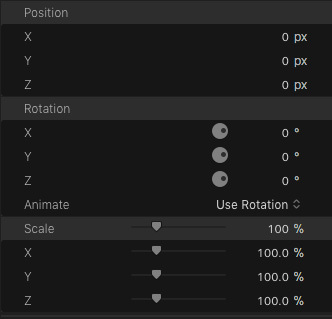 Plus, because color correction is now built into the Inspector, making changes is easier than ever. 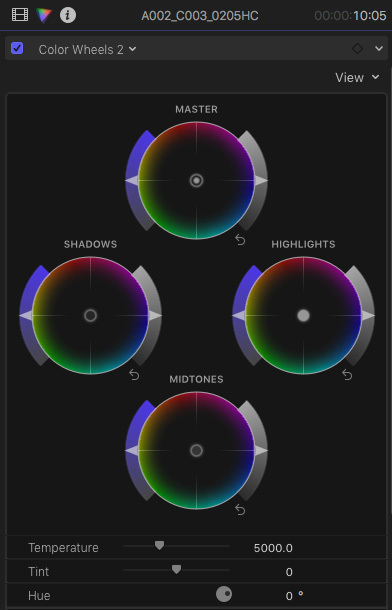 Maybe I should also mention that color correction settings can now be keyframed, that multiple color effects can be applied to the same clip, and that color and shape masks still exist. Yeah, these new color changes are stunning. Cool Note: Apple added a color picker to the Balance Color effect. This converted the automated color correction tool from “close-to-useless,” to “AMAZING!! !” With one click you can color balance a shot and, this time, it works great! This did not make the “Top New Features” list, but it is brilliant and very useful. 3D text, which has been problematic in the past, continues to gain stability and rendering speed. What I really like, though, is that we now have full position, scale and rotation control in 3D space for both 2D and 3D text. And, every setting can be keyframed. Oh, yeah… THIS is cool! Final Cut now supports mono and stereoscopic 360° Video. We can watch it on our computer display, or a Vive headset. NOTE: VR requires an HTC VIVE headset connected to our Mac with Steam installed and the SteamVR app enabled for output to a VR headset. Apple recommends using a 27-inch iMac with Radeon Pro 580 graphics for optimal performance when editing 360 video with a VR headset connected. Even better, Final Cut Pro editors can edit 360 video without a connected VR headset on any system that supports Final Cut Pro 10.4. Using the mouse, keyboard, or headset, we can pan, tilt, view, wander and dream inside a 360/VR movie. I had a very brief time to play with a headset and it is pretty amazing. What I especially like, since I am still coming up to speed on many different elements of VR, is that we can use an inexpensive camera to shoot some 360/VR experiments, then, without investing in an expensive headset, just start working with the media inside FCP X using the built-in computer monitor and tools. Getting started with VR has never been easier. NOTE: There is also a very cool new tool, called 360° Patch that gets rid of the tripod at the bottom of the frame. It works like the Clone tool in Photoshop, except on video. Very, very cool! Apple stayed with the interface they introduced in the 10.3 version. In fact, media management, editing, trimming, timeline organization and transitions haven’t changed. Titles are the same, with the addition of seven titles specific for 360° Video. Generators are the same, with the addition of two new generators for 360° Video. And, as far as I can tell, transitions are the same, period. There is a neat new keyboard shortcut: Command + Left/Right Arrow. This moves the playhead to the next clip in the same role and selects it. This is a very fast way to do color grading! This version of Final Cut, like other major releases, will update your libraries the first time you open them. Once upgraded, these libraries can no longer be opened in earlier versions of Final Cut. Behind the scenes, only the library databases are being modified. Media is never affected by an upgrade. This upgrade process is reasonably quick. My small projects upgraded almost instantly. Larger project may take a bit longer. Keep this library upgrade fact in mind if you have multiple editors sharing projects. Everyone will need to upgrade at once. You’ll also need a system that can run macOS 10.12.4 or later. NOTE: Like version 10.3, the 10.4 version cannot upgrade FCP X 10.0 Events or Projects. It can upgrade every version of FCP X from 10.1 onward. And, just to stress, media is never affected by an upgrade. WHAT ABOUT COMPRESSOR – WHAT’S NEW? In other words, all the new formats that were added to Final Cut Pro X are also supported by Compressor. NOTE: If you plan to work with HDR media, buy yourself some extra storage, you’re going to need it. And, plan to shoot, edit, export and compress 10-bit or greater files. All ProRes formats fully support 10-bit, but many cameras, such as AVCHD, do not. WHAT ABOUT MOTION – WHAT’S NEW? Easily convert project types to switch between FCP X titles, generators, effects and transitions. A new behavior, called “Overshoot” builds spring-loaded animations automatically, without keyframes. No longer do we need to specify what we are creating at the time we first create the Motion project. Now, anything in Motion can be converted to anything for use inside Final Cut Pro X; more or less. 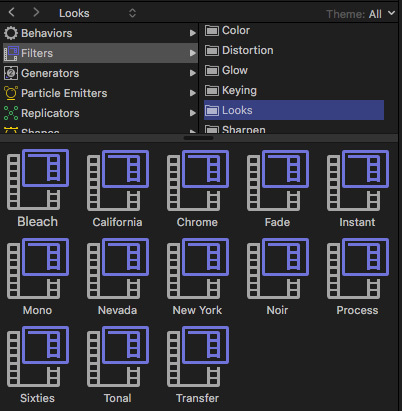 NOTE: Based on the version of Motion I looked at, the contents of the Motion library seem essentially the same, with the addition of the same new 360° Video generators and titles that also appear in FCP X 10.4. Given how aggressively Adobe and Avid are supporting team editing, and especially because Final Cut Pro X is built on a database engine, it continues to surprise me that collaboration is as difficult as it is. This is compounded by Final Cut’s limited support for editing libraries using shared storage, even when connected via 10gb Ethernet. Editing teams exist for even small projects today and Final Cut does not make it easy to share libraries or projects. Media sharing, of course, has been available since the introduction of FCP X.
I am a huge fan of Roles. They make making many tasks much easier, especially when it comes to exporting – but not audio mixing. The idea of applying a compound clip to a role so that we can apply filters to the compound clip is an exercise in frustration. Audio mixing in FCP X is ridiculously awkward. It is far faster to export an XML file from FCP X, convert it using XtoCC, import it into Adobe Audition, mix the project, export a stereo pair, import it into FCP X, assign a role to it, then export the finished project than to attempt to do the mix in FCP X itself. I know, I timed it. FCP X is 3-6 times slower than round-tripping in Audition. Roles are great, but not for mixing. Finally, it may be that Apple has increased the number of clips that can be supported in a Library, but I’m getting emails almost every week from editors experiencing performance slow-downs because they have too many clips in a library. Again, FCP X is a database, it should be able to handle far more clips without choking. Smile… on the other hand, if we didn’t each have our own laundry list of stuff that Apple “must fix,” well, there’d be no excitement surrounding an upgrade. NEVER upgrade in the middle of a project. Finish the project then upgrade. Hold off upgrading if you use lots of plug-ins until you verify with their developer that they work. That being said, there are refinements throughout the app, though more with effects than editing. The new version is worth the time to upgrade. Once you start using the new color tools, you’ll never go back. So what should you do? If you love being on the cutting edge AND you are between projects, upgrade today. If you are a died-in-the-wool skeptic, wait a month and see how this rolls out before committing. There’s no harm in waiting – especially if you depend on 3rd-party plug-ins and software. What am I going to do? I’m upgrading my main editing system to 10.4 tomorrow and keeping two backup editing systems on 10.3 for the next month or so. I like this new version and I’m looking forward to using it for real productions. The features in this update make it a very compelling release. SPECIAL NOTE: I’ve created extensive new video training covering all the new features in Final Cut Pro X 10.4. Click here to learn more. where can we find a list of compatable cameras for 10.4 I understand Sony’s EX1 files are not supported. Apple fixed close to 100 bugs in the 10.4.1 update. I just imported 20 clips in AVCHD format into FCP X 10.4.1 with no problems. Having a non-supported camera makes things trickier. 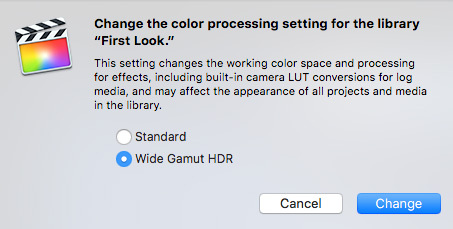 What you might want to do, before upgrading, is to bring your camera or camera card into an Apple store and see if FCP X 10.4.1 will properly import it. When I updated from 10.4 to 10.4.3 I had yo modify the library containing my project to be compatible. But now there are missing files in my project and I cannot find them to relink. I trashed my 10.4.3 version and replaced it with the previous 10.4 version. But now my library will not open because its changed files are now incompatible with the 10.4 version. What can I do? You are correct – once you update a library, you can’t go back. However, the differences between a 10.4 library and a 1l4.3 library are relatively benign. Files should not disappear. Time to call Apple Support. By definition, a mono audio clip plays equally to both the left and right channels. Automatically. You can adjust the pan for any selected audio clip in the Audio Inspector.